the Sun, is quite deliberate and truly represents our Live SunSmart mantra. It emphasizes the fact that we want everybody to enjoy the great outdoors, but just to do so in a “sun smart” way. The Gala gives us the opportunity to thank our many supporters, to honor those who help spread our message throughout their communities, to highlight our successes as well as our Live SunSmart partners and to RAISE MONEY!. 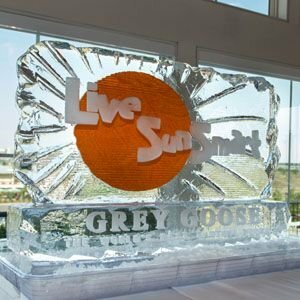 The Places in the Sun Gala is an evening like no other with fantastic entertainment and delicious food in a spectacular setting overlooking the Manhattan skyline. Guests have the opportunity to mingle with the honorees as well as other celebrities who then become the table hosts and share stories of their career. The cocktail party is chock full of fun and interactive entertainment. The event features a Roll to Win Wheels dice game where participants have the chance to win a new car! Simultaneously, there are roving magicians, including the fabulous Michael Chaut, and a silent auction with unbelievably unique experiences. For those who like the look of being tan but are SunSmart enough not to bake themselves, Sephora and ULTA have each set up a Bronzing Bar to splash guests with a refreshing touch of bronzers to give them that "sunkissed" glow. Beer Garden - Brooklyn Brewery hosted a Beer Garden. Did you know that beer needs to be sunsafe too? The hops in the beer “skunks” at the exposure to UV rays. 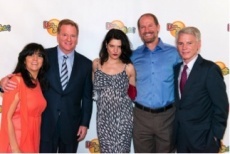 Jim is such a great friend and ardent supporter of the Foundation. He generously gives of his time and dedicates a huge amount of energy to making this evening a success. He lends his expertise and moves the evening along with the finesse and grace of a true host. Thank you isn’t enough to express how grateful we are to him. Spencer joins us each year in the celebration and share his antics as our Live Auctioneer. We can’t imagine how we became so lucky as to have him on our team. He too gives graciously of his time and adeptly manages, with the precision of a surgeon, to remove money from our always-generous supporters’ wallets without causing alarm. The evening is capped off with entertainment provided by Republic Records. The Co-presidents, Monte and Avery Lipman, are longtime friends of Ray Festa and his family and always support the efforts of the Foundation. In the past, we have had the honor of hosting newly-minted Season 2 winner of NBC’s The Voice, Jermaine Paul and Season One runner-up, Foundation supporter and forever friend, Vicci Martinez along with other rising stars. As you would expect, they mesmerized the crowd with their incredible talent. In 2012, we were fortunate to have America’s Got Talent runner-up, Tom Cotter. He was a true delight and had the audience doubled-over in laughter. We are so grateful to him still. Even with all of the wonderful educational and entertaining activities, the highlight of the evening is the presentation of our awards of distinction. The Apollo Award recognizes the contributions of an individual who advances the message of the Live SunSmart Foundation and serves as a role model to the public for leading a SunSmart lifestyle. The Greek God Apollo, recognized as the god of light and the sun, was an oracle who delivered wise counsel to his followers and embodied the ideals of truth and prophecy. 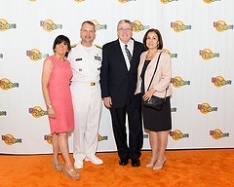 As such, the award recipient serves as an ambassador for educating his/her community about the importance of the prevention and early detection of melanoma and other skin cancers. Through lifestyle modeling, public activism and unwavering commitment to the cause, this individual’s primary concern is to make a significant impact in the reduction of occurrences of melanoma and other skin cancers. An individual who through his/her work and/or volunteer efforts promote the mission of the Live SunSmart Foundation by educating others on the importance of regular skin cancer screenings and the proper use of sunscreen. An individual who helps shift behaviors to become more sun-safe aware in his/her community. An individual who helps create alliances with corporate, sports or educational entities to further the education and support for skin cancer prevention. As our inaugural recipient, Bill has made it his personal mission to educate the public about melanoma and its risk factors and to encourage people to take a more active role in their skin health. Through his work with the Live SunSmart Foundation and other melanoma groups, he is helping to bring awareness of melanoma to the people across the country. RADM Lushniak released a first-ever Call to Action on prevention of skin cancer and melanoma which defines a public health agenda for all skin cancers. His dedication to this disease is laudable and desperately needed in the public dialogue. He shares the Foundation’s passion for making skin cancer prevention a part of our social norm and strives to alert people of the need to Live SunSmart every single day. The Carnevale Spirit Award is given annually to someone or a couple whose outstanding service to his/her community has helped define and shape its character. Created to honor the memory of Tony and Dorothy Carnevale, whose passion and love of their community was clearly defined by their unselfish devotion to enhancing their hometown. True to the definition of their name—Carnevale--Tony and Dorothy, both spirited and dynamic souls, brought a zeal for life and an unparalleled enthusiasm to all their volunteer efforts. Carmen and Yogi Berra exemplify dedication to community giving and spirit. Their work with the Yogi Berra Museum and Learning Center, the Boy Scouts of America and Lee Iacocca’s Statue of Liberty—Ellis Island Foundation are among the many examples of their generosity of time, spirit and enthusiasm. They have been friends and avid supporters of Live SunSmart Foundation where they served as Advisory Board members until Carmen’s death in March of 2014. Peter King exemplifies dedication to community giving through volunteerism and his active role on behalf of others. His work with many charities and causes is remarkable - most notably the Wounded Warrior Project, Habitat for Humanity, Write On Sports, food pantries and of course, Youth Travel Softball to name just a few - and are among the many examples of his generosity of time, spirit and enthusiasm. 2014 Presenter of Carnevale Spirit Award to Peter King. 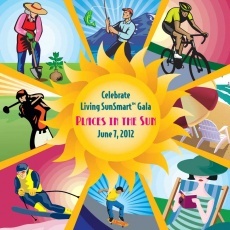 For more information about our Celebrate Living SunSmart Gala, please email Jennifer Davis or call: 973-744-3557.